A sequel that takes the franchise in a direction that could lead to many possibilities positive or negative. Three years after the theme park & luxury resort of cloned dinosaurs was shut down due to a containment breach, the island’s dormant volcano roars back to life and threatens to kill the remaining dinosaurs on the island. A former dinosaur wrangler and the current head of the campaign to stop the re-extinction of dinosaurs must team up on an expedition to rescue as many dinosaurs as possible from the dangerous land mass. As they work with a team of outside crusaders, a conspiracy emerges that could lead to a version of the world not seen for millions of years. Owen Grady is the former Velociraptor handler for Jurassic World who is contacted to help round up the dinosaurs on Ilsa Nublar before the island’s volcano has an extinction level event. Claire Dearing is the former operations manager for Jurassic World who is the head of the Dinosaur Protection Group working to fund an expedition to save the dinosaurs on Ilsa Nublar before its volcano kills them. Maisie Lockwood is the granddaughter of Sir Benjamin Lockwood who is not aware of what she is as she tries to make sense of all the chaos that has descended on the mansion that she calls home. Eli Mills is the ambitious assistant of Benjamin who is a former partner of John Hammond, who recruits Owen and Claire to rescue the dinosaurs from the island with the goal of relocating them. Jurassic World is a sequel that switches the type of film it leads you to think it is supposed to be half way through the motion picture. This is a solid sequel that falls back on some of the tropes first used in the original Jurassic Park. Chris Pratt gives a fun performance with Justice Smith, Daniella Pineda and Isabella Sermon doing a great job of making the film feel real with their honest reactions of terror to the dinosaur attacks. J. A. Bayona did a good job directing this sequel in a way that the horror elements in the story are able to be tension starters to set off events for some of the more exciting scenes. 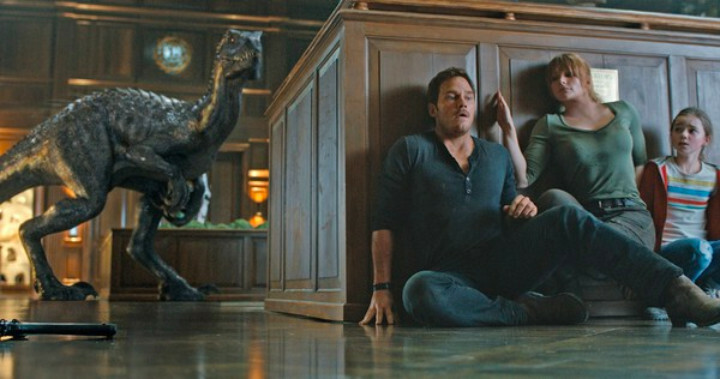 Derek Connolly and Colin Trevorrow deliver a script that feels like it had a strong start but lost its way to it inevitable conclusion that made it feel a little rushed once they got from the island to the mansion. This was a roller-coaster ride that ended abruptly, but in a way that promised another roller-coaster ride to come with bigger thrills. This theatrical release gives us some interesting sequences, but for each of them there are at least double that amount of scenes that are just retreads of other Jurassic movies or eye rolling leaps of logic. I rate this movie a rating of 2 & 1/2 out of 5. Stay after the credits to see where one of the rescued dinosaurs ended up in the United States after it escaped.